My Treks have been reduced here lately, and I'm not getting out as much as I once did. However, that doesn't mean that I'm not still finding my way behind the camera every now and again. It just so happens that this past weekend, my wife and I celebrated our 4th Anniversary and we went back to our favorite cabin in the mountains. It was going to be a short time and I wasn't overly concerned with getting pictures as I was last year. This time, I took my camera more as an afterthought than anything else. When we would go out during the day, I would take it, but it was more so I would have it just in case rather than a planned Trek. 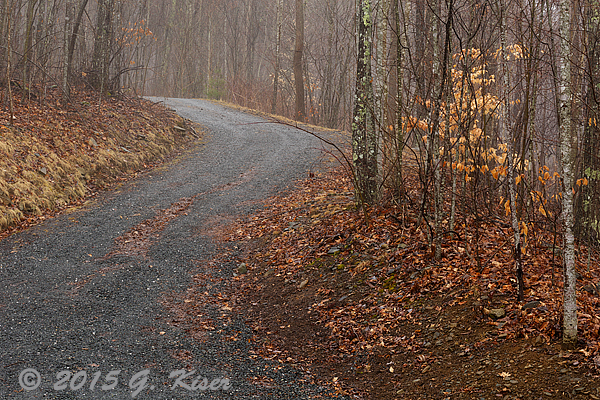 As the weekend progressed, we did some driving around looking for things to photograph, but nothing really excited me. It might have been that the sky was pretty much cloud free, it might have been that the temperatures were below 20 degrees most of the time, it might have just been that my heart really wasn't in it this weekend. We woke up on our last day and got all packed up and ready to head home. It was raining outside, and just a generally dreary kind of day. I had been the last three days without even taking the camera out of the bag, so I wasn't even thinking about photography at this point. Then Toni went into the kitchen where she could see out of the back doors and she got all excited. She said something to the effect that the clouds were low in the valley and that was what she wanted to pastel! That was all the introduction I needed to come and and give it a look. Sure enough, the clouds were doing some awesome things in the valley, and even in the sky above, there was some nice visual interest. I decided that I would have to give this a shot or two, and see what I could come up with. Since I didn't have access to my long lens last time due to a warranty repair, I was kind of excited to give my 70-200mm f/2.8L a shot from the deck. Since breakfast was being cooked, I wasn't looking to leave the cabin, and honestly, the view that I had was good enough to keep me right there without even wanting to go out to find anything else. Had I tried, I would have lost the conditions that prompted me to get the camera out of the bag. 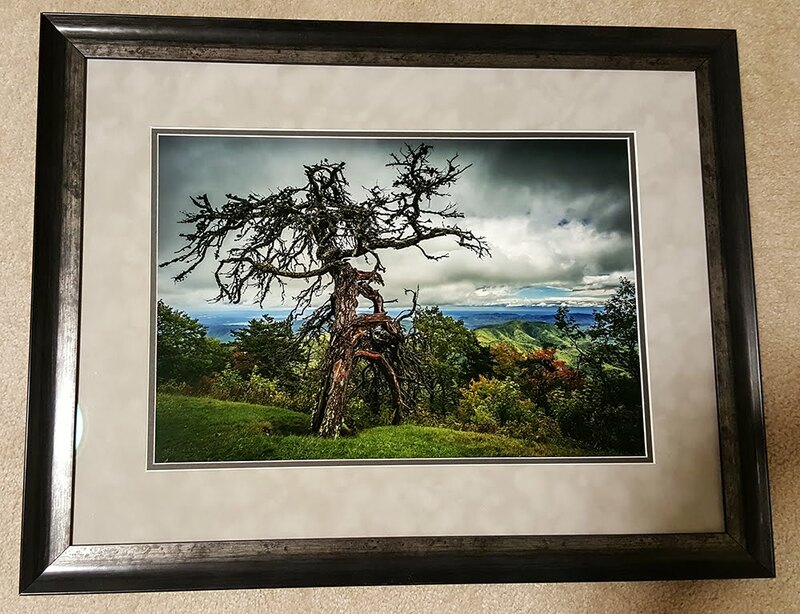 I mounted everything on the tripod and started framing shots. The lighting was nearly perfect and required nothing in the way of filters at all. 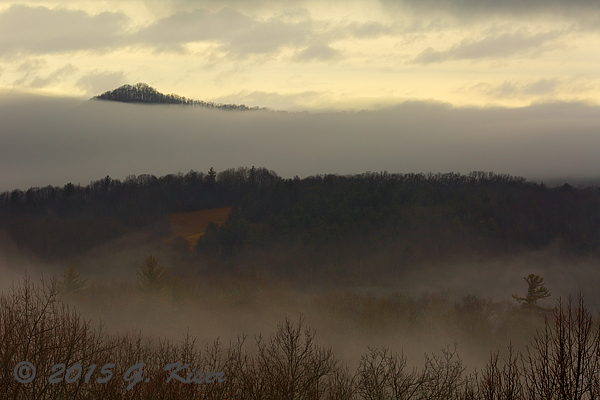 Within minutes, the clouds changed and obscured the distant mountain top, which eliminated my primary focus. However, since I was out here based on Toni's sighting, I decided to search out a tree or two since she really likes the winter trees without their leaves. 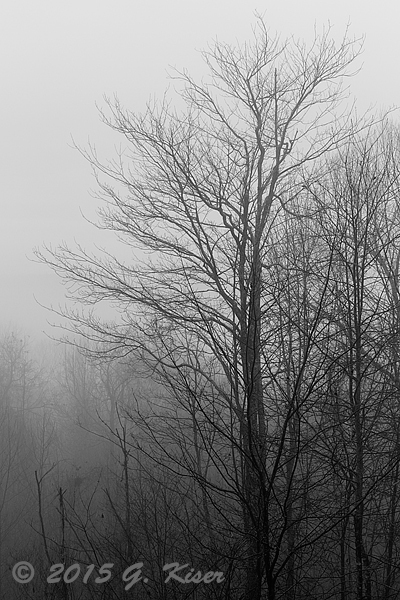 The fog makes for a wonderful backdrop for trees, and it also helps to isolate them. I found one that stood out a little bit better than the other trees and shot a few frames before looking for other subjects. While still on the deck, I moved the other side of the cabin and the view of the driveway struck me as pretty awesome this morning. The fog was rolling through and doing really cool things with the trees just at the road. I liked the view so much I just planted the tripod right where I was standing and fired off a few more shots from both portrait and landscape perspectives. Again, the lighting was just perfect with no need for any filters on the lens, and the 70-200mm lens framed everything just right, so I didn't even need to swap out lenses. 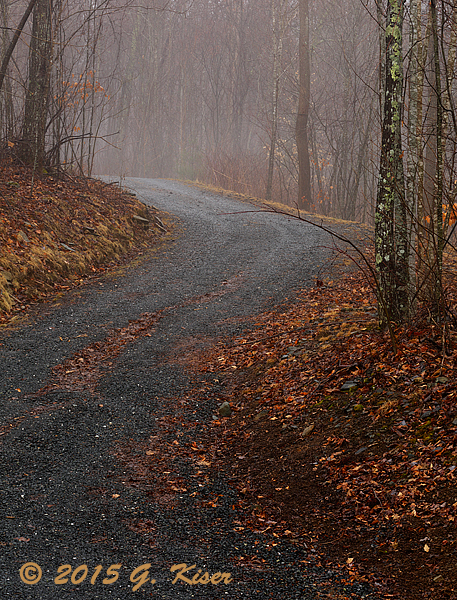 This worked out pretty well, and proves that this driveway is actually quite photogenic. Last year I shot the entire cabin in the snow from the top of the driveway looking back down the hill. Feeling like things were actually coming together for me quite well this morning, I walked around the cabin to see what else would benefit from the dreary conditions of the morning. I found this nice large rock which was set up at the corner of the driveway. Years ago, there had been a frog on it, but it was missing last year. 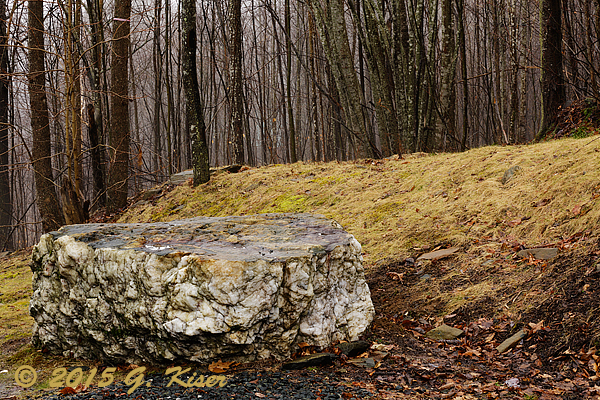 Today, the leveled rock seemed quite photogenic and was juxtaposed nicely with the strong vertical elements of the trees behind. In order to keep the bright sky out of the fame, I left my long lens mounted and shot at a relatively long focal length to minimize the background and compress everything. I was pretty happy with how this one turned out, but I had to cut it short at the rain was starting up again, and I was starting to get wet. I had forgotten a jacket when I went outside so it was time to head in for some breakfast. After I finished breakfast I looked outside once again and found that the clouds were clearing out, and the rain had stopped. I could see some more potential in the landscape right outside of the cabin. I grabbed the camera once again, and mounted my 70-200mm once more, but with the addition of a 2x teleconverter to get me a little bit closer to the areas I wanted to shoot. This worked out very well, and I found that the sky was starting to show some yellow tints here and there. With a flick of the white balance, I moved it over to Shade, and took full advantage of the warm light that was showing through the clouds. 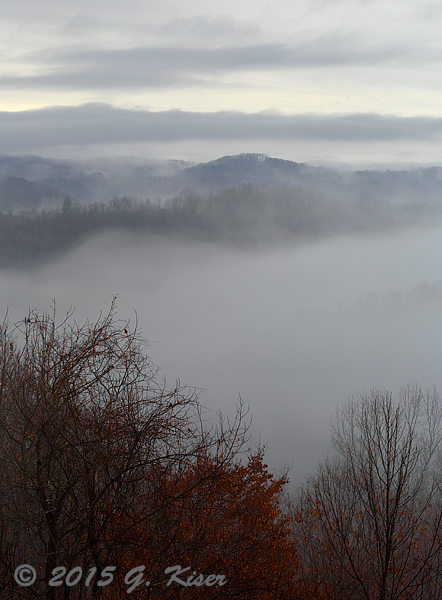 The mist in the valley below was still quite mystical and fun to play with. I have to admit, I had a lot of fun with the extra reach of the teleconverter, and this marked the first time I had really used it in the field. With the extra reach, I was able to pick out some really good detail as opposed to getting a grand view of everything. This allowed me to isolate the parts of a scene that I found interesting. In this picture, it almost looked like the treeline was a dam and the clouds were overrunning it. 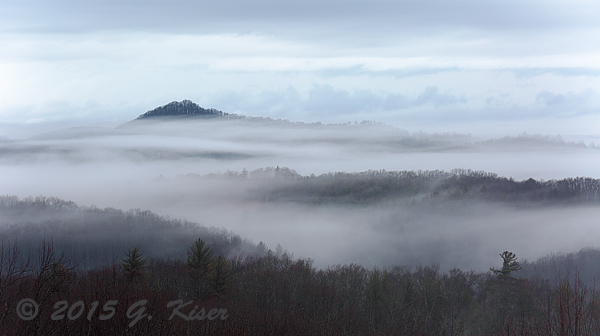 The protected valley below was now enveloped in a rush of clouds as they moved in from the dense sea of clouds just beyond the trees. Of course, the tip of the mountain in the distance provides a much needed visual clue to the actual density of the clouds. 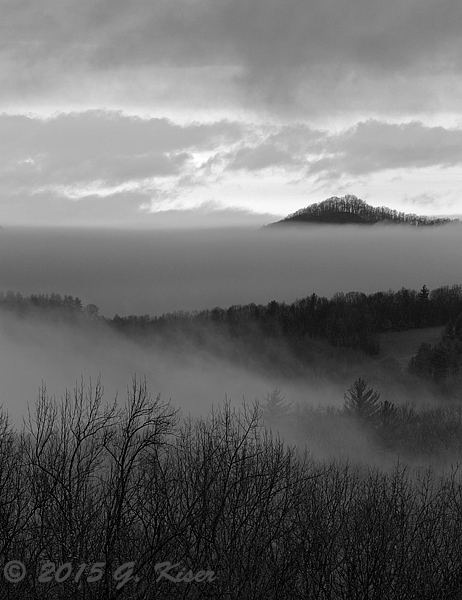 Sometimes, the abstract qualities of low clouds make for an interesting picture as well. There is not as much clear definition in this shot, other than the visual anchor at the bottom. In the distance, the clouds and mountains blend and merge. It begs you to look closer to determine where one stops and the other starts. While not one of my favorite shots, I really feel that this one has merit because it does draw the viewer into the image better than some other shots. There is also a very strong monochromatic appearance here that is offset with the red of the tree at the base. It's just enough to add another abstract element to the image that asks more questions than it answers. Considering that I had gone three days without pulling the camera out of the bag, I was pretty sure that I wasn't going to have any pictures to process when I got home. Just hours before we left the cabin, Toni changed all of that when she looked outside and caught the scene that we had both been waiting for. Had it not been for her, I probably would have come home with an empty memory card. Instead, I shot over 30 frames, and ended up with eight pictures I felt were good enough to keep and share here. I'm happy with what I brought back, and they will always be special pictures to me since they are from such a wonderful anniversary weekend trip.